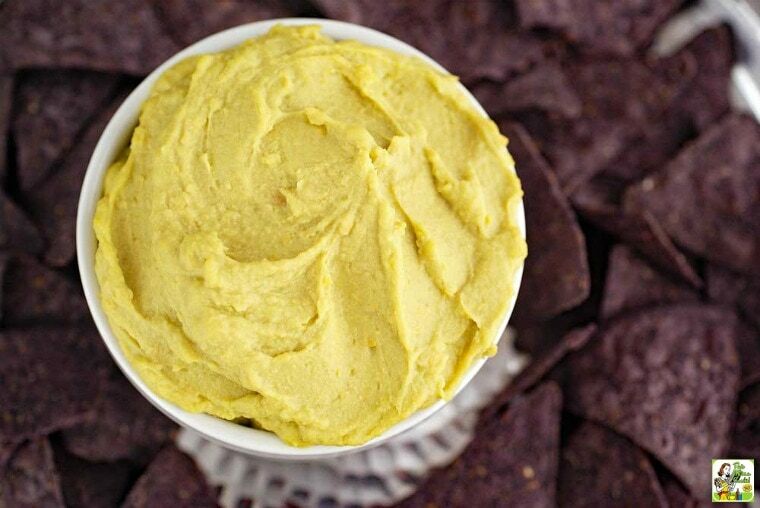 Do you love making homemade hummus recipes for parties? Then try my Avocado Hummus. Your guests will love it! This appetizer is gluten free, dairy free, vegan, and filled with healthy fats and protein. 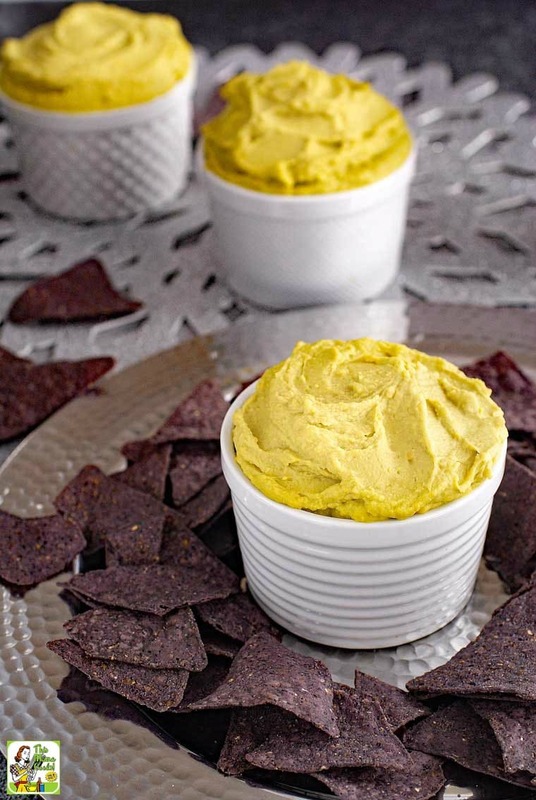 Make a double batch of Avocado Hummus to bring to a sports watching or St. Patrick’s Day party. That way you know you have one guilt-free dish you won’t feel bad about indulging in! Making homemade hummus recipes is easy! Making this spicy hummus is so easy to do that you’ll wonder why you bother buying premade hummus at the store. All you need is often already in your pantry or refrigerator – extra virgin olive oil, a can of garbanzo beans (also called chickpeas), tahini paste, garlic, salt, lemon juice, and some hot sauce. Usually all you need to do is buy a couple of ripe avocados. The only other thing you need is a food processor or a high powered blender. If you make a lot of dips and smoothie recipes, it’s worth buying a good blender. I have a Blendtec and love it! When my kids broke it, the company replaced the jar for free. 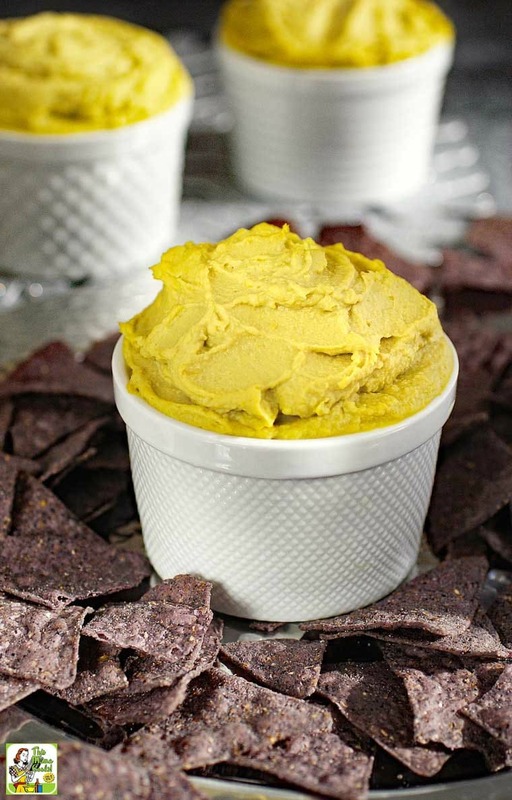 Homemade hummus can be served as a dip with chips, crackers or veggie sticks. 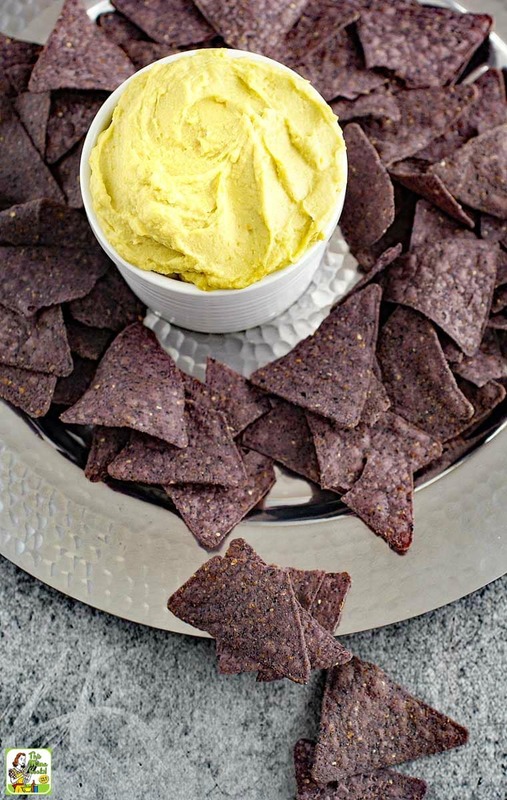 Avocado Hummus is a fun appetizer to serve on any holiday or tailgating party where serving something green is appropriate. Hummus also makes a terrific sandwich spread. To make pinwheel sandwiches, spread it on tortillas. Then roll and slice. Did you know that you can make vegan meringue cookies from the chickpea brine? So don’t throw it out! Here’s a recipe on how to do make them. I can never find ripe avocados at the store when I need them. However, I’ve had better luck in the organic section. You pay more, but you get results! Looking for more party dips? Try Avocado Dip Veggie Shooters and Spinach Artichoke Dip. Store in an airtight container in the refrigerator until serving time. Serve with tortilla chips or veggie sticks. Originally published on December 1, 2014. Updated with new pictures and information. I just made this, and it is now my favorite Hummus recipe. Thanks for sharing. I really like avacados and hummus, so I believe this is the recipe for me. I look forward to trying it soon. Thanks for sharing. Love the addition of avocados! So delicious! I love Hummus! I bet this is amazing! This looks so good! I’m going to make it this week. Love guacamole! This recipe sounds amazing! Yum! I love avocado! This looks like a great party food! I love love love hummus! I will have to try this recipe out! This sounds fantastic! I am all for hummus, especially when it is a bit different like this! Oh my gosh I’m alerting my daughter to this ASAP. She is a hummus connoisseur! This sounds so yum. i enjoy hummus and sopicey things bet this taste good. Now that is a fun hummus I want to try! It looks so amazing! And I just love Pompeian Extra Virgin Olive Oil! It’s my favorite olive oil to cook with! Sounds delicious. Would make a great app at holiday parties. I’ve never actually tried hummus before, but I LOVE avocado! I bet I’d really like this. Putting this recipe on my to do list! Am I an odd ball? I have never tried hummus or avocado. I’m really intrigued to try guacamole though with chips. Sounds yummy! Well hello hummus! OMG — you have two of my favorite things in this dish — avocado and hummus. They taste amazing together! I will have to try to make this for my next party. I know it will be a huge hit. That looks delicious. This is a great humus recipe. The avocado makes it so healthy! I absolutely love hummus! I’ve never actually tried to make it on my own – going to have to try this! Plus, my husband would be all over the little kick! Great looking hummus!! Love these flavors! This would make a great neighbor Christmas gift. It looks easy and sounds amazing. I can’t wait to try it out. It’s great to hear that Pompeian is a monitored olive oil. Adding spice to hummus is the best! I can eat hummus everyday, all day long, and this look delicious! It would make a great holiday or teacher gift along with a couple cans of garbanzo beans, some sea salt and the hot sauce. for the wedding gift, if you wanted to be extravagant, you could also include the blender! Mmmm, I love me some hummus! And now, I’m craving like you wouldn’t believe! Need to make!! I have a newly discovered love of avocados. I think this sounds delicious. This looks amazing! I love avocado, and I love hummus. It doesn’t get any better than this! This is a no brainer! I love hummus, avocados and all things spicy! Sign me up! Love me some hummus! This recipe looks wonderful. I live quite close to Pompeian. I love their products! I can’t wait to try some of their spray cooking oils! I am always looking for a new hummus and love the spicy avocado! Yum! You had me at hummus!! Love all these ingredients!